The Künstlerhaus is a 19th century villa at the Salzach River, just beyond the southern edge of the Altstadt (Old Town). The Künstlerhaus is one of the few arty and independent venues of Salzburg, which one would not expect from just looking at the façade from the outside. The origin of the Künstlerhaus can be tracked back to 1844, the time when Salzburg started to slowly recover from the devastating Napoleonic Wars and the looting of Bavarian troops. That year, an art club (Kunstverein) was founded that provided its members with assistance in purchasing or selling art. The first chairman was Prince Archbishop Friedrich Schwarzenberg. In a way, the Künstlerhaus was the first private art gallery of Salzburg. Within the first few months of its existence, the Kunstverein drew some 600 members, which it considered a great success. The current Künstlerhaus was built in 1885 in the typical Gründerzeit style of its age. 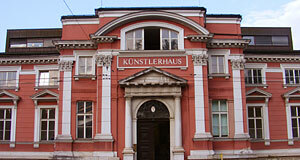 Today, the Künstlerhaus is still owned by the Salzburger Kunstverein. It is run as a multi-functional art venue with exhibition space, a café (known not only for its arty atmosphere, but also for the great balcony facing the river), workshops, meeting rooms and office space. The Künstlerhaus tries to generate a libertarian atmosphere and would succeed in doing so - was it not to stand in the middle of Salzburg, probably the least progressive and least avant-garde city in Europe. That being said, we love it passionately the way it is and only idiots would expect a little chunk of Berlin or New York in a 19th century villa in Austria anyway. The Künstlerhaus has a scheduled program of symposia, discussions, exhibitions and lectures that can be requested directly at the site, online or via the "Dachverband Salzburger Kulturstätten" (Association of Cultural Venues in Salzburg), of which the Künstlerhaus is a member. There is also a library in the Künstlerhaus. The building was extensively renovated in 2001 in an attempt to modernise the interiors and re-store the Gründerzeit appearance of the outside.